Imagine not being able to see the world in all its glorious colour. Help is at hand for those afflicted with colour blindness. 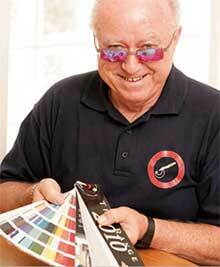 Brian Currie’s view on life has changed, literally, since wearing colour-correcting glasses. Brian Currie remembers getting hidings at school for colouring the grass red in art. “The teachers thought I was having them on,” he recalls. But Brian was not fooling around. In fact, he was completely oblivious to his mistake. Like eight percent of all European males here, he couldn’t differentiate between the colours red and green. To him they both looked brown. Brian eventually learned he was colour blind. Colour blindness, or colour deficiency as the experts like to call it, is a condition in which certain colours cannot be distinguished and is most commonly due to an inherited condition. It is caused by a malfunction of the retina which converts light energy into electrical energy that is then transmitted to the brain. Molly Whittington, an Auckland optometrist based in Kumeu, specialises in helping people with colour deficiency. She explains that the conversion of light is accomplished by two types of photo-receptor cells in the eye's retina: rods and cones. “The cones are responsible for colour vision. Each contains visual pigments sensitive to wavelengths of light – red, green and blue. "Most people can match all colours of the spectrum by mixtures of only these three fundamental colour sensitivities. The huge variety of colours we perceive comes from the cone cells’ response to different compositions of wavelengths of light. Defects in colour vision occur when one of the three cone cell colour coding structures fails to function properly. One of the visual pigments may be present and functioning abnormally. Or it may be absent altogether." “The cones with the blue are almost always normal,” says Molly. “So blue deficiencies are very rare. It’s the red/green spectrum that’s affected by the colour channels. Fortunately the blue/yellow channel remains pretty much unaffected." ”The condition is far more prevalent in men than women, with only 0.4 percent of European females being colour deficient. That’s because the condition is linked to the X chromosome. “Women have two X’s. If women have one good X, then there’s no problem. Because men only have one X, they get the colour deficiency." Molly says it’s thought there’s an evolutionary explanation to why we and western cultures have a higher rate of colour blindness than, say, the Japanese, of whom five percent are colour blind. The most common test for colour blindness is the Ishihara test. Within these patterns are dots which form a number visible to those with normal colour vision. Can you see them? You should see 12, 74, 6 and 2. For most people with colour blindness, it can be frustrating and occasionally dangerous, depending on the severity of the condition. Traffic lights are not so bad because colour blind people get to know the position of the colours. But sometimes caution lights – when there is just one light that could be red or green – can cause a problem. Buying brightly coloured clothes can also be challenging. Many men depend on their wives or partners for colour choices, says Molly. Several tests are available for colour blindness. The most common is the Ishihara test, featuring plates with dots of different colours interposed with colours that are easy to mix up. Within the pattern are dots which form a number visible to those with normal colour vision. Molly says if someone is not colour deficient, the colours of the dots are clearly different. But the test doesn’t rank severity. “It’s not designed to show people with mild or severe colour blindness.” Molly has other colour-matching tests which rank severity. Until recently it was thought that if you were colour blind, you were stuck with it for life. “They said it was genetic and you couldn’t treat it,” says Molly. But a professor who worked with Dr Ishihara, the Japanese man who created the original test for colour blindness, has developed his work further. After many years of study he has come up with a new lens that can help significantly. While attending a conference in Melbourne in 2007, Molly discovered the lenses. “I was really surprised at the difference these lenses can make,” she says. Keen to try them out on someone colour deficient, she offered them to her brother. “He had always thought my house was green and when he got the new lenses he thought we’d painted the house. I told him it had always been orangey brown. A big treat was going to the Monet Exhibition in Wellington. When he was there, he realised he had probably never been able to appreciate art before. Even though he only wears glasses about 10 percent of the time, being able to see the world in all its colourful glory was certainly worth the cost of investing in the special lenses.